the LORD God called to the man and asked him, "Where are you?" Then he asked, "Who told you that you were naked? from the tree of which I had forbidden you to eat!" she gave me fruit from the tree, and so I ate it." "Why did you do such a thing?" The woman answered, "The serpent tricked me into it, so I ate it." while you strike at his heel." because she became the mother of all the living. R. (1) Sing to the Lord a new song, for he has done marvelous deeds. R. Sing to the Lord a new song, for he has done marvelous deeds. blessed are you among women. and the virgin's name was Mary. "Hail, full of grace! The Lord is with you." and of his Kingdom there will be no end." since I have no relations with a man?" for nothing will be impossible for God." 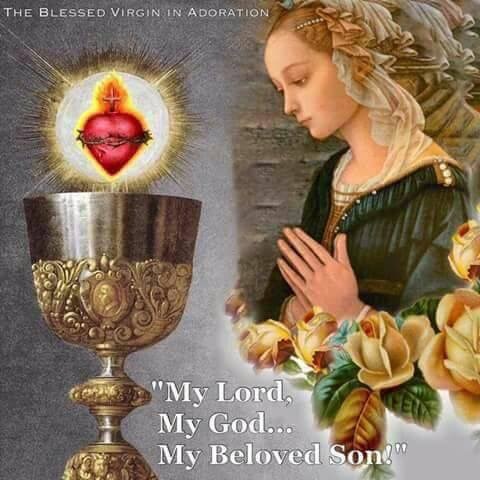 Mary said, "Behold, I am the handmaid of the Lord. May it be done to me according to your word."